When I looked up the details on the Skip The Line Eiffel Tower Tour on GetYourGuide.com I was skeptical about the duration shown. Three hours, really? How can it take that long to walk the 4.5kms from the Church of the Madeleine to the Eiffel Tower? How am I going to keep my kids engaged on a three-hour walk? 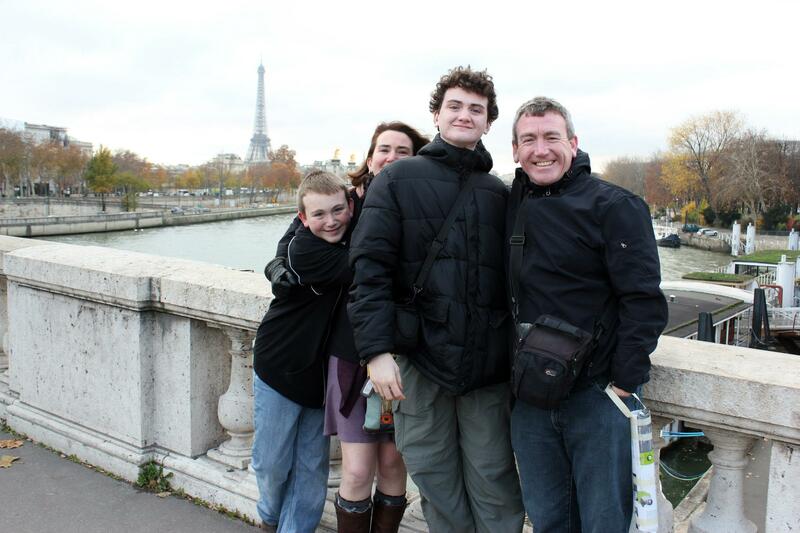 As it turned out, the three hours flew by in a whirl of ambling, chatting, French history and fun. The map above is the route we took. We stood at the church of the Madeleine and shivered on a brisk November day. Alex, our young Kiwi guide did a short round of introductions and then directed us to look straight down the broad street to the imposing building across the river. The Assemblee Nationale. Hey, look at that, it looks just like the church. That was a deft distraction from the cold and almost an abrupt: “Right, we’re going to spend the next few hours talking about French architecture, French culture and French history – but it doesn’t have to be painful. Let’s go have fun.” With that our little group of 12 was off. And so it went. At the Place de la Concorde you could see that Alex particularly enjoyed regaling macabre and gruesome details about the “Place de la Revolution”. (My kids lapped it up in true teenage boy fashion). Without noticing we’d had a mini crash course in La Revolution we crossed the street and within minutes we were deep into whether or not Lance Armstrong should repay the Hotel Crillon for his eight complimentary stays there (a little-known benefit of winning the Tour de France) or not. Next up was a stop that you can only do while on a walking tour: a pause on the pedestrian crossing looking down the Champs Elysee. Just for good measure (while we waited for the lights to change again) Alex directed our group to observe even more historical and architectural French flair i.e. the symmetry of the view from the Jardin des Tuileries towards the Arc de Triomphe. We crossed the river and had our first photo shot with the famous Tour in the background. My kids were actually excited, who’d have thought? Who walked along the river for another French history lesson stop at Les Invalides and then crossed back across the Seine. 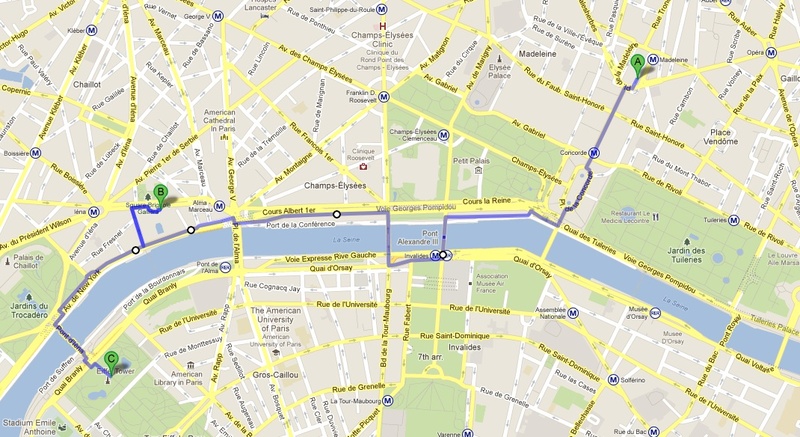 From my husband: “Careful BigB, you’d better not fall into the river – you’d be in-seine. Haha.” Witty Murphys. In a lull in our tour guide’s banter and a little time while the rest of the group quietly enjoyed the walk we got the dreaded “I’m bored” from CAM and BigB. “Let’s do cities, you go first – start with A”. By the time Alex gathered the group at the next stop BigB had charmed the other people in our group into helping him remember the names of cities and almost everyone else was listening in on our game. We stopped at the Flame of Liberty, the unofficial memorial for Princess Diana, found yet another statue of Simon Bolivar on his horse and continued on towards the Museum of Modern Art. Of course we talked about the May 2010 heist of paintings by Picasso and Matisse. The story, a comedy of errors, with CCTV cameras pointing the wrong way, a fancy new alarm installed but not turned on and sleeping security guards sounds like a movie script. And the exterior cameras still appear to be pointing in the wrong direction. CAM was fascinated. The last stretch of our walk took us down Avenue de New York to the Jardins du Trocadero for an Eiffel Tower picture-taking fest followed by a mini-lecture on everything you ever wanted to know about the history and construction of the Eiffel Tower. It was just as well we were done with our letters game (thanks to even Alex for pitching in on the awkward letters X, V and Y) so we could all focus on learning about Gustaf Eiffel, the 1889 World’s Fair and the other nitty gritty details. My geek boys loved that the tower escaped demolition because wireless antennas were installed during WWI. Alex escorted our group to the base of the tower and said his goodbyes. A tour guide who is so enthusiastic in his subject matter, who easily engages with each of the members of our tour group and has fun with kids is a rare thing. We genuinely enjoyed our three-hour walk while learning more than we thought we’d ever know about Paris and France. The best part of the tour though, was the skip-the-line part at the tower. By the time we got there it was dark and cold and the line was still quite long. We were waved on to the express elevator for a quick ride to the first platform where we had a short wait before riding all the way to the top. What a view. You can book the Skip The Line Eiffel Tour on the GetYourGuide website. I highly recommend it – we had a blast. Before our trip to Paris GetYourGuide, a Swiss booking website for tours and activities had contacted me and invited me to take one of their tours in exchange for writing a review of the tour. GetYouGuide provided us with complimentary tickets to the Skip The Line Eiffel Tower tour for all four of us but did not stipulate that I express any particular point of view in my review. 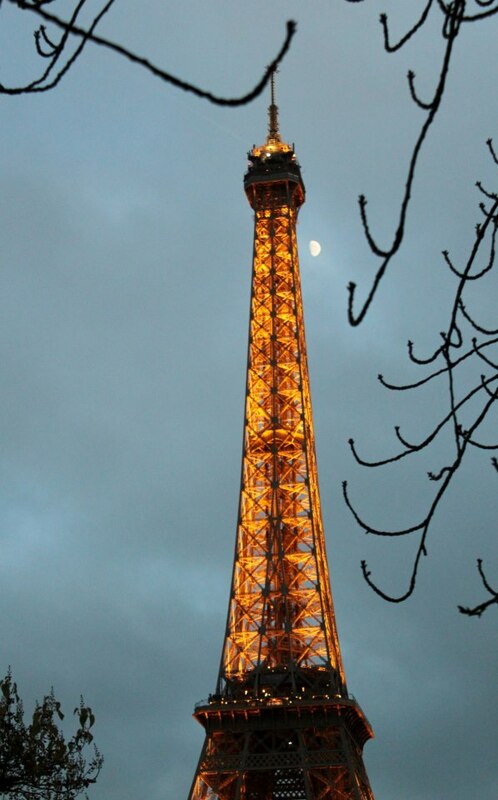 This entry was posted in France and tagged Eiffel Tower, France, GetYourGuide, Paris, Tour Eiffel on December 20, 2012 by wandermom.